WARNING: This product can expose you to chemicals including Di (2-ethylhexl) phthalate (DEHP), which is known to the State of California to cause cancer and birth defects or other reproductive harm. For more information go to www.p65Warnings.ca.gov. Durable backpack is constructed of a strong, ballistic fabric with diamond ripstop accents to keep your belongings safely stored. Padded laptop compartment protects most 15.6" laptops from shocks while traveling. Smart sleeve allows the case to slide over upright handle tubes for easy transport. Brushed tricot sunglass pocket protects the frame and lenses of your eyewear from scuffs and scratches. Two quick-access storage pockets keep smaller items easily within reach. Dual-density shoulder straps are contoured to disburse weight more efficiently on your shoulders. 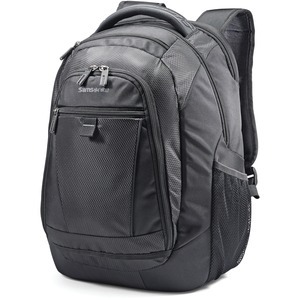 Plus, the padded top carry handle is perfect for traveling shorter distances. Tablet/iPad pocket and business organizer offer a handy location to store more of your essential items. Side mesh pockets feature an elastic top to prevent water bottles from falling out during travel. California Proposition 65 Warning WARNING: This product can expose you to chemicals including Di (2-ethylhexl) phthalate (DEHP), which is known to the State of California to cause cancer and birth defects or other reproductive harm. For more information go to www.p65Warnings.ca.gov.